Replacement signs for the Swing Sign sign mount. Sign only. No hardware. 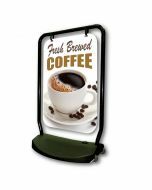 • 20"x 30" sign printed 1 or 2 sides • Signs are made of economical polystyrene rigid plastic or durable aluminum composite material • Water bases weigh 30lbs when filled with water • Add antifreeze to water for use in subfreezing temperatures • Indoor or outdoor use • Swing Signs are easily moved. Just tilt and go. Let the wheels do the work.